The one who bows in humble reverence to the Lord, the Lord of all beings. I sacrifice myself to such a Guru, who himself is liberated, and He carries me across this world. Which all of your glorious virtues should I chant? There is no end to it. There are many many millions of them, but there are very few who contemplate on them. I am wonder-struck and amazed and am saturated in crimson beauty of my beloved. Says Nanak, the saints savour this sublime essence, like the mute person, who tastes the sweet candy, but only smiles. 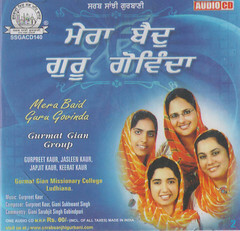 This entry was posted in Shabad Kirtan and tagged Gur, Gurbani Sangeet, Gurmat Gian Group, Gurmat Sangeet, Gurpreet Kaur, Guru, Japjit Kaur, Keerat Kaur, Keertan, Kirtan, sacrifice, Shabad, Shabad Kirtan. Bookmark the permalink. Very Good. you are doing very good work. I have never listen this kind of music till now. All other ragees are very greedy and only target to money. Buy your talent is very rich. You promote your group more. i will also promote you group. 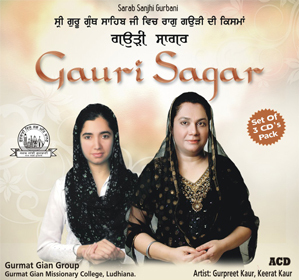 This is all wonderful and you are very blessed that you can say the words inthe Guru Granth Sahebji with your very very beautiful voices and the best ever heard tunes…. I am sure Guru Nanak would have been so proud of you and all the jatha. You are blessed ! So much hard work and devotion definatley derserve recognistion. Really excellent.Keep it up and all the best for future. 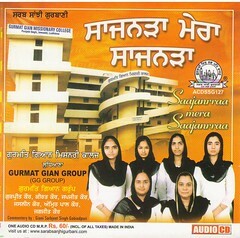 Wonderful singing of the GLORY of SAT GAURU NANAK DEV JI MAHARAJ . for all the gifts as also blissful living . Since HE is so kind in his nature to look at us THROUGH HIS MOST WONDERFUL DARK BLUE EYES , thus granting conversion from ZERO VALUE in this commercial world into THAT OF HERO . for a very small duration of 40 days only at any stage of life . Without any doubt whatsoever & with full guarenttee by DHAN DHAN BABA NAND SINGH JI MAHARAJ , ONE would succeed in meeting HIS DARK BLUE EYED SAT GURU NANAK , from the LIVING GURU GRANTH SAHIB JI MAHARAJ . What a great boon of OUR BELOVED GURU JI ? continue into singing HIS GLORY ………………………………………………..
Kehnde ne sonne di chamak sab to vakhri hundi hai te jad us nu suhage di shoh prapat ho jave tan……………………..
te jad ih raag ch gaaee jave te sur de naal avaaz v amtit maee hove ta fir ki kehna. aap sab vdhaee de patar ho ji. 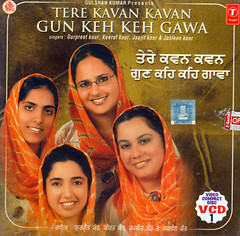 VERY VERY SWEET RAS BHARYA KIRTAN…………. THANKS !THANKS !! THANKS !!! 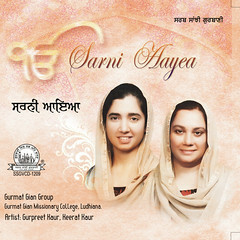 Waheguru ji ka Khalsa, Waheguru ji ki Fateh ji, today I have listened to your melodious, rythematic and sweet shabads, my ‘Rooh’ sarshar ho gayee hai. 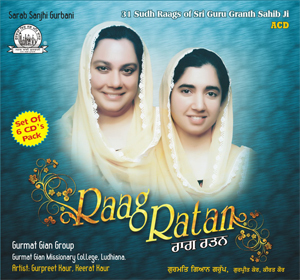 Thanks so much for putting together our holly bani into raag. Please note: there are some punjabi spelling mistakes in the translation version of the Gurbani, if you need any help correcting that, you can contact me, I will try to correct those spelling mistakes according my ‘tuchh budhi’. Thanks again, Waheguru ji ka Khalsa, Waheguru ji ki Fateh, ji. Many thanks for the appreciation. There may be many mistakes of spellings & translations. Do find and send me the corrections.We would try to rectify them. And do keep visiting, as we keep adding new shabads frequently.